As mentioned in an earlier post, I joined Ahmed in his mini-exile in Turkey as soon as I could (in October), and the day after I arrived he proposed by the Bosphorus Strait near the Topkapi Palace! The next few weekends were packed with travels to meet his brother’s family, sister’s family, and extended family, who were all welcoming and lovely. I love big holiday gatherings of cousins and nieces and nephews. Then we traveled to the famed ruins of Ephesus and a cold and rainy yet enchanting Cappadocia. Ahmed got his visa renewed just before I left, so he’s back in New York, and I’ll follow soon. I’m in Oklahoma doing some advance planning for the wedding. We’ll have the ceremony at my uncle’s small back country vineyard and the reception in my parents’ backyard, with a dance floor under the carport and our most graceful tree hung with twinkle lights and homemade glass candle lanterns. We’ll make Ahmojitos and Pam-a-coladas and invite the whole family and lots of friends. Should be a heck of a party. The book will be out mid-March, and my website has a link to the book’s Amazon page, where you can pre-order. If you wouldn’t mind passing the link on to your social networks, it would be hugely appreciated! I have a few dates available in some cities, so if you have ideas for venues or contacts, please send them my way. Hope to see you somewhere along the road! Meanwhile there’s exciting news on the Palestine pop culture front: Travel guru Rick Steves plans on doing shows in Israel and the West Bank this spring (not Gaza, unfortunately . . . baby steps). Plenty of people go to Israel, but it’s ground-breaking to do a travel show on the West Bank. He did a terrific show in Iran a few years ago, which was very well received. Things like that make a mindless march to war just a tiny bit harder. His publisher and mine are both members of the Perseus Books Group, and my editor contacted his people and suggested my book as a source of information for his trip. He’ll get a copy as soon as it’s published, and he might interview me on his travel show while I’m in Seattle. The timing couldn’t be better. I’m also glad my book is coming out just as Obama begins his second term, with Hagel up for Secretary of Defense and the Israel lobby on the defensive. They’re still very powerful, but that power is ebbing, slowly but surely. I hope my book can knock a bit more wind out of their sails in the realm of public opinion. On that note, I just got word that Publishers Weekly has designated my book one of the top ten travel books of the year! Not sure how they can do that since the year’s barely started, but hey, I don’t plan on complaining . . .
P.S. Here’s a previous post with a little more about the proposal story, wedding plans, and a picture of the ring. 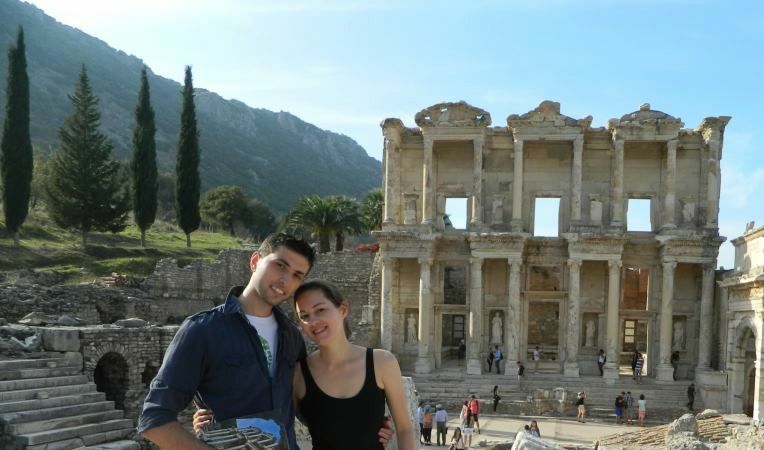 You can see more photos from our trips on Facebook albums here (Ephesus) and here (Cappadocia). P.P.S. This is a copy of an email I just sent to my list. I don’t always post them here. If you’d like to be on my email list (and receive about six emails per year from me), kindly send a note to pamolson (a) gmail.